They had a work day at Freedom Baptist Church today. All the church folks showed up at 9:00 a.m. this morning ready to go to work. They started by helping me unload our equipment into the church. They cleaned, mowed, weed eated, hung lights, hung fans and even helped me setup our equipment. By about 4:30 this evening I was ready to go on the air. Lord willing we'll start broadcasting their Revival with Dr. Mike Ragland starting in the morning at 10:30 a.m.
We made it to Bogalusa, Louisiana this evening. The folks at Freedom Baptist Church had a very nice room waiting for us at the Travelers Rest Motel. What a Blessing! Thank you Lord! I spent the first half day packing up at Currytown Baptist Church in Lexington, North Carolina while Mary washed and packed our clothes over at the Mission House at Spruce Street Baptist Church. I think it was about 2:00 p.m. this afternoon before we got out of town heading for Bogalusa, Louisiana. We made it to Birmingham, Alabama and spent the night at the downtown Howard Johnson. I always hate to come to the final night of a meeting. This week has been great at the Currytown Baptist Church in Lexington, North Carolina. We have enjoyed lots of good singing, preaching, and food. It has just been great. We enjoyed another fabulous night at Currytown Baptist Church in Lexington, North Carolina. The singing was just the best ever with "The Gilley Family" from Decatur, Alabama and the preaching was second to none with Dr. Bobby Roberson. It was all just fantastic. The Gilley Family from Decatur, Alabama. Fantastic Music. We had the great priviledge tonight of videoing Dr. Bobby Roberson, Pastor of Gospel Light Baptist Church in Walkertown, North Carolina. He is 80+ years old and we have enjoyed lots of messages on CD, DVD, and the internet but this was our first time to hear him in person. What a joy to get to broadcast and make a DVD of this hero of the faith. It was also our joy to be with Dr. Noah Frye again tonight. He and Dr. Roberson were born in the same year. We sure enjoyed our time at church tonight. It was great. We enjoyed a wonderful day at Currytown Baptist Church today. The Singing and preaching were just great. We thoroughly enjoyed our first day. I think the broadcast and recordings all went as planned. The bottom picture is Mary's time exposure of the youth choir that sang tonight. I went to work this morning at 10:00 a.m. and worked until about 5:00 p.m. without stopping. I think I am ready to broadcast the services in the morning at Currytown Baptist Church. I am very tired tonight. We went to Golden Corral for supper. We arrived in Lexington, NC about 3:00 p.m. this afternoon. I met a few men at the Currytown Baptist Church and they helped unload our equipment into the church. I worked a couple hours and mostly setup our display in the lobby. I gave up about 8:00 p.m and decided I had had enought for today and went to join Mary at the Mission House at Spruce Street Baptist Church. This place is huge. Three bedrooms and two baths, big living room and dinning room with kitchen. We stayed here the last time we were in Lexington. We love it here. Thank you Lord for a very nice place to spent a few days. We headed out for Lexington, North Carolina this morning. We are scheduled to do the video for the 2009 Jubilee at the Currytown Baptist Church in Lexington starting Sunday Morning. We made it to Knoxville and decided we had had enough driving for one day. We spent the night in the Knights Inn on the north side of Knoxville. 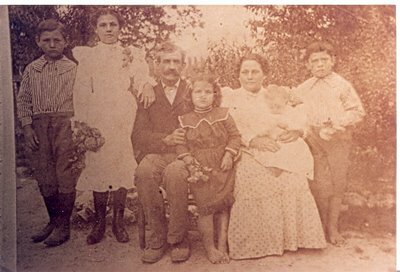 Mary found this old picture of her great grandfathers family and had me scan it tonight. The father is Preston Simpson Brooks Ball, (Birth 12-26-1857 South Carolina) to (Death 12-2-1913 Little Rock, AR). The wife is Rebecca Ball, (Birth 8-13-1856 Holly Springs, AR) to (Death 4-20-1930 Little Rock, AR) and she is holding Mary's father, Preston Brooks Ball, (Birth 2-9-1902 Little Rock, AR) to (Death 2-12-1978 Little Rock, AR). We are not sure of the names of the other members of the family. Today we watched a lot of preaching video from the Internet. We watched some great messages by Dr. Jack Hyles during Pastor's School in the early 90's. The most intriguing was Dr. Bill Grady. We had never heard him before. One of his books has captivated our attention. "How Satan Turned America Against God". We heard him speak about many things he wrote in the book. Then I went to his website and read the Introduction to the book. Now I would like to get my hands on a copy of the book. We went over to Otter Creek to a birthday party for our Pastor tonight. We enjoyed some great food and fellowship. Jared came over this evening and replaced the glass in our garage door again. After a lot of tweaks and installation of a brace, our door seems to be working again. I did not realize how much I missed the garage door until it would not work. Praise the Lord for garage doors. This is the first house in our entire lives that has a garage door. We sure enjoy it. We went over to Scott and Lacey's house for a while this afternoon. Lacey's youngest, Bella, is celebrating her 7th birthday this weekend. We had the opportunity to see their latest pictures from their Christmas trip to Disney World. I think Lacey said they took over 900 pictures on the trip. We enjoyed our time with them. I kept working on my printer problem until noon today and decided I had had enought. I called HP Tech Support. It took nearly an hour before I talked to someone who could help me. He did a L1, L2, L3, and L4 uninstall from the CD (D:\util\ccc) folder. He removed some registry entries. I could not keep up with what he did. He also removed the Program Files\hp folder. The big difference seem to be that he downloaded the latest software from the hp website instead of using the CD that came with the printer. It took from noon until 3:15 p.m. to finish the whole ordeal but it worked fine when he finished. I can not get our new Officejet Pro L7780 printer to scan a document. It worked fine yesterday. Today when I double click "HP Solution Center" it gives me "No HP Devices have been detected. HP Solution Center will close now". I worked till midnight to no avail. I have tried everything I could find on the internet. I have uninstalled and reinstalled until I have forgotten how many times I did it. Right now it seems pretty hopeless to fix the problem. This evening I learned how to transfer Domain names to another person on GoDaddy.com. My friend Mike Pridmore is taking over the website at Crystal Hill and I transferred three domain names to him. It's really pretty simple but I had never done it before so we struggled for a while trying to make it happen. This afternoon, Jared, my nephew down the hill, came over to help me work on our garage door. Last time he worked on it he broke one of the glass panes out of the door and today he replaced it. While we were trying to make the door work properly, we broke the glass again. We have a plan that might fix the door but I need some things from Home Depot to continue. After about 15 years our old HP Deskjet 990c Pro has started giving us much trouble. We have been studing printers for a couple months and today it was on sale at Best Buy so we decided on the HP L7780 Officejet Pro. It's a very nice 4-in-1 that prints, scans, copies, and faxes. My inital tests prove that it is going to do the job for us. We love it. We can access it through the network from all our computers. I had to visit the Dermatoliogist today. He put me on Lamasil last month because of an infection under my nail on my little finger. Today he wanted to see the progress and do some blood work to see how the Lamasil was affecting my Liver. I think my little finger is better but not completly well by no means. He said it may take 2 or 3 months to heal. 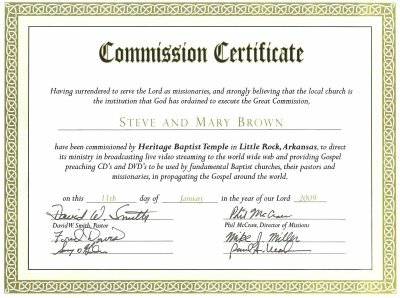 Tonight Heritage Baptist Temple had an official Commissioning Service to Commission Mary and I to be an Evangelistic Video Ministry sent out of Heritage Baptist Temple. This opens the door for Independent Baptist Churches around the world to support our ministry. I left Sprint/Embarq on December 31, 2007 trusting the Lord to take care of us. I told the Lord we would continue as long as He would allow us to. So far the Lord has provided for us to continue for over a year now. We'll just keep trusting Him to provide our needs. With the help of the men at Twin Cities' Baptist Temple in Wake Village, Texsas, we packed and loaded our equipment this morning and headed home to Little Rock. We have covered a lot of miles these past two weeks from North Carolina to Texas and home again. It's always good to come home. Thank you Lord that we have a home to come to. We had a great crowd tonight for the final night of the BEAMS Bible Conference in Wake Village, Texas. I thought Dr. Johnny Pope preached one of his very best messages tonight entitled "A Man After God's Own Heart". I will have to make a very special DVD case to display this message. I wish everybody could hear this message. BTW, you can. 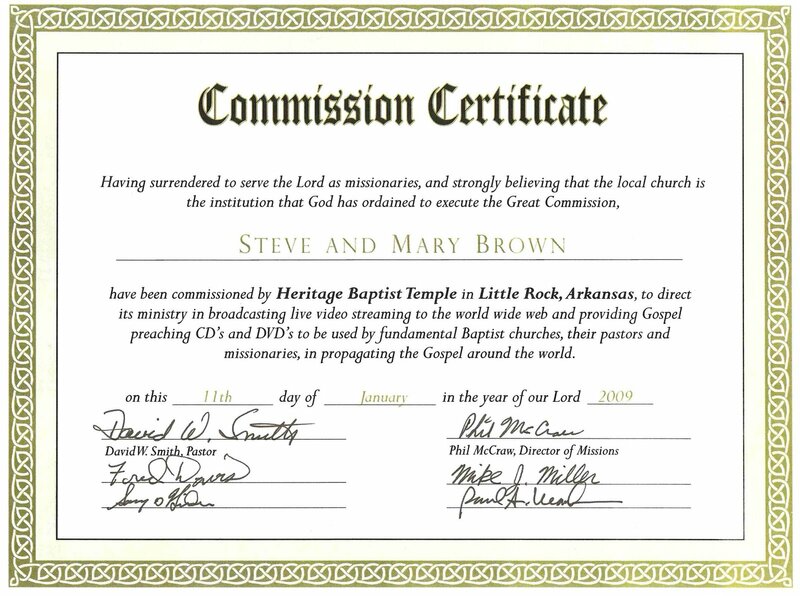 Just go to SteveBrownMinistries.com and click "View" beside the message title. Dr. Johnny Pope preached a most unusual message tonight entitled "The Bruised Reed and the Smoking Flax". I was totally intrigued with this message. We had a great service tonight with Mary providing special music. Mary sang "People Need The Lord". She did a fantastic job. I also thought the other message by Dr. J.C. House was an outstanding message tonight entitled "Finishing Faith". Wow! We are so blessed to hear such great preaching and singing every where we go. Our first service of the B.E.A.M.S Bible Conference went very well tonight at the Twin Cities' Baptist Temple in Wake Village, Texas. 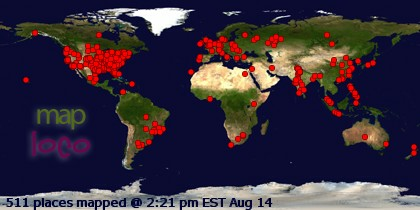 The internet access was the best we've had in a long time. When I got back to our apartment I played the DVD and discovered that I have a bad lip sync problem. I can not imagine what's going on but the sound is not sync'd with the lips at all. It's really bad. I'll have to try to figure out something tomorrow. We started out early this morning from Birmingham, Alabama. It rained very hard on us most of the day and made driving very difficult. We arrived at Twin Cities' Baptist Temple in Wake Village, Texas about 3:00 p.m. this evening. Some of the men from the church helped me unload all our equipment. I am really grateful for the help. It seems like I just keep having back problems and the men relived my burden greatly. I went ahead and started setting up in the church until about 10:30 p.m. I hope tomorrow will be an easy day. We left Mooresville, North Carolina this morning headed for Wake Village, Texas. I shot this picture as we came through the Smoky Mountains. I thought we were going through Little Rock and we might even spend the night in our own bed. Somewhere before we got to Nashville, Tennessee we heard that things were icing up around Little Rock, so we headed south to Birmingham, Alabama. I was hoping we would get farther along on our journey, but Birmingham is as far as we got. We spent the night in the Howard Johnson. Now we still have a little over 500 miles to drive tomorrow. At least it's warm down here and no ice. We had a great service for our final night at Liberty Baptist Church. Dr. David Harrison preached a message titled, "Basic Principles of Prayer". I thought it was great and a message I really need to apply to my life. I need to watch it again when I can really concentrate and not have to run video cameras. The men helped us pack our equipment after church so we're ready to leave in the morning for Texas. We had several hundred young people attend the Voice of Hope Regional Youth Rally at Liberty Baptist Church in Mooresville, North Carolina tonight. We enjoyed lots of singing and preaching. We enjoyed special music by the Rochester Family. They sang bluegrass gospel and it was great. From what I can tell our DVD and CD turned out pretty good tonight. The internet access was really bad so our broadcast was low quality tonight. We spent most of the day setting up our video equipment at the Liberty Baptist Church in Mooresville, North Carolina. This is one of the bigger churches that we have been to. It seats about 1100 people. They are expecting around 650 young people for the Regional Youth Rally tomorrow night. I'm in a real quandary trying to figure out how many DVD's to burn for the meeting. We spent our day traveling to Mooresville, North Carolina. We did take a little detour and drove through the Great Smoky Mountain National Park. It was not as pretty and it was a few weeks ago when we drove through it with the fall colors but the mountains still have a special beauty during any season. We just love driving through the mountains when we have time.